This should not be used but is still available for backwards compatibility. Can be used to obtain a valid filename and its full path. 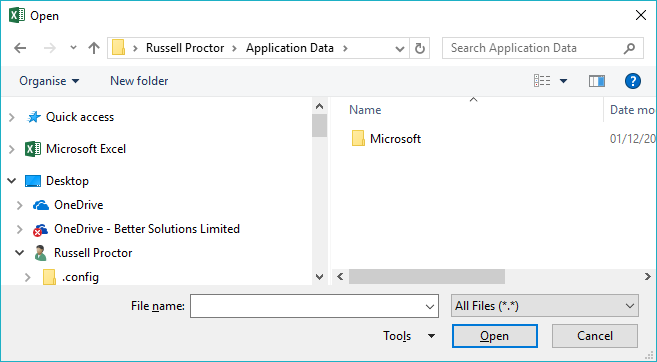 This method displays the Open dialog box but will not actually open the file. This method will return a string value specifying the path and filename that was selected. FileFilter - This determines the types of files that will be displayed in the Files Of Type drop-down list. This argument consists of pairs of the file filter display text followed by the wildcard file filter specification. Each pair seperated by commas. The default is "User (*. *), *. *"
FilterIndex - This specifies which file filter is the default. Not required if there is only one filter provided. ButtonText - This argument is not used in Excel for Windows. MultiSelect - Determines if the user can select multiple files. If you allow multiple files to be selected you can use the IsArray() function to check if multiple files were selected. All the arguments are optional. When you want to filter the choice to specific file extensions you must use the following format: "description,*.extension"
The following line of code will display a dialog box allowing you to select an XML file. The value this function retuns must be assigned to a variant.